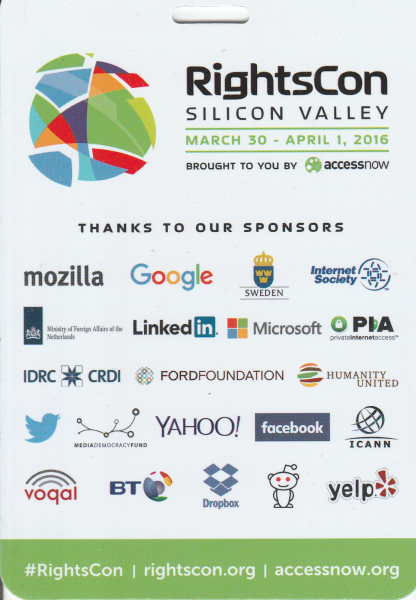 I got invited as a panelist to RightsCon2016 to discuss taking an another step in connecting the next billion people on the internet. It was the first time for both, being a panelist as well as visiting the United States of America, so I was pretty excited and greatful for getting a chance to do so! The trip wouldn’t have been possible without the Electronic Frontier Finland ry footing the bill on flights and accommodation in San Francisco for five days, approximately 1150€ altogether. 29th: The only pre-event to the conferece I knew of, was the EFF‘s (our idol organisation) happening at the Rye bar at 6pm. Met many interesting people who were about to participate in the sold-out conference, including EFF’s Danny O’Brien, who gave us some tips on where me and my ICANN buddy Farzaneh could get some quick dinner near by. I also met the host of the conference there, Brett Solomon, who is the executive director of AccessNow, the organisation running RightsCon. 30th: My initial schedule looked like this. It was going to be seriously busy for the next three days, with heaps of interesting topics, out of which some were held at the same time, unfortunately. After the opening ceremony and panel with Bruce Schneier and others, it was time to hit the cryptosummit 2.0, for which suddenly there was room for a few more people, despite it being sold out. That was a really good workshop, which aired out the conclusions and there will be progress on all of the four tracks mentioned. As a bonus, I gathered my courage to ask Bruce Schneier, whether he was selling any of the few copies of his new book, Data and Goliath, that he was carrying around. To my surprise, he gave my one and autographed it to me too! The Cryptosummit 2.0 was held from noon until 6pm, after which I went to the cocktail reception hosted by Cloudflare. I met many interesting people again, from a Canadian Munk University Global Affairs and the government of Netherlands to recall a few. 31st: As soon as I fired up my laptop in the morning, I got to know that my grandmother died and that took the wind out of my sails quite spectacularly. I didn’t get to the site before 10am and I was a wreck after that as well. I decided to have a proper lunch and start preparing my share of our panel at 2.30pm. While having my sandwiches outside in the sunny, grassy yard I met an interesting guy who does photography in the conflict zones around the world. The panel itself went really well, I felt. As a result, there were several new participants to our mailing list on improving community connectivity. We had an interesting discussion on the means of pushing community networks to more people, especially in rural areas. One of the conclusions was to list the most used content and applications in the internal network of a community, and to include that list in the best practices website. April 1st: Participated a panel on Trolls, threats and online free speech that was discussing boundaries of free speech and listing examples of modern threats against different groups online. Also discussing the constitutional laws (1st and 4th amendement IIRC) that were conflicting on these issues, but that was mostly relevant to American citizens. Next on the agenda was a workshop on how to get media attention and break through on your issue. After that I went to a really helpful workshop on encrypting your communications with PGP. I feel, that once I install Linux on my laptop, I would be able to apply PGP on my emails. I think I could also now be ready to help hosting a cryptoparty for Effi or the Pirate Party. I missed the workshop on Closing the Gap on Global Connectivity, because the room was too full. That was too bad, since I had waited to know more about this area of community networking. Altogether, had a very engaging learning experience and met loads of interesting people, of which most of were working towards similar goals as Effi and the Pirate Party are. I would definitely recommend this conference to anyone, who finds digital rights (privacy, freedom of speech..) interesting and wants to build networks of other people, who want to engage in these issues. I wanted to mention how I think it’s great that you are helping and informing your users of their rights online on your page here: hän.fi/2016/04/17/rightscon2016/. I’m a firm believer of standing up for our rights, but not many people think about our right to protect ourselves online. Nowadays, every internet user is susceptible to being spied on or hacked, and yet we continue to expose ourselves. I saw this guide (they also recommend AccessNow) vpnmentor.com/blog/ultimate-guide-online-privacy/ which helped me understand the different ways we can protect ourselves online. I am sure your users would greatly appreciate if you share this guide and let them know how they can stay safe online.